“This place is famous. People loving coming by here because at any time of year you can get something to eat.” Architect Mark Lakeman, co-founder of the City Repair project, gives a tour of the corner sidewalk outside his Portland office building, where a food forest is bursting with life. A diagram shows where over 80 plants are located in six or seven vertical layers. Tall fruit trees, flowers, a grape arbor, herbs, berries, small vegetables, and ground cover are abundant. Related: TD Tree Days: Building an edible forest Dozens of environmentally conscious residents showed up with shovel in hand to help the TD Friends of the Environment Foundation and the Raisin Region Conservation Authority plant trees for TD Tree Days. While nobody is suggesting that we inherently begin detesting grass, growing it on the scale we do and with all that effort to keep it cleanly cut, fertilized and free of weeds, i.e. natural biodiversity, is proving a huge burden on the planet, its animals (who aren’t allowed to graze on lawns), and the people so determined to have a perfectly picturesque front garden. Amazingly, we have found a way to both destroy the environment and ruin animal habitat, all the while giving ourselves heaps of work without any real return on the effort. But, there is a revolution afoot, and it’s not about whether or not the grass is greener here or there but reinventing the lawn itself. In a word, we are revolutionary real estate spectators who notice the productive potential of these open spaces around our homes, and we are making gardens abundant with food and with a splendid array of colors, species, flowers, microclimates, water catchments, animal habitats, and patios (for the humans). Rather than crushing the spirit of nature, mowing her down every weekend, we are encouraging new growth, and new thinking, our minds not locked into the “need” to prove we can grow grass. We are not a cult, but rather cultivators, and we are looking for people to join us. Read Why Our Lawns Are Bad for the Environment and How to Change Them for the Better by Jonathan Engels at Permaculture News. It would be great if we all had an acre or two, the time, and inclination to grow our own food, but the realities of the day are that the majority of people have moved into more confined, urban and suburban settings in order to be closer to jobs, entertainment, school districts, conveniences, and whatever else tickles our fancies. It’s the world as it is: Over half of us live in cities and suburbs. While this can be a bit restricting when it comes to home food production, it certainly doesn’t spell the end to it. For every suburban lawn, there could be a beautiful herb spiral providing fresh, medicinal ingredients for breakfast, lunch and dinner. For every bathroom, kitchen window, or sunny corner of the living room, there could be productive, edible houseplants. Then, those small outdoor spaces like patios and balconies can be amazingly abundant as well. Read How to Make a Productive Patio by Jonathan Engels at Permaculture News. A perennial “backbone” will not only increase the aesthetic qualities of your vegetable garden landscape, but it will also welcome all kinds of beneficial insects and animals to your garden. 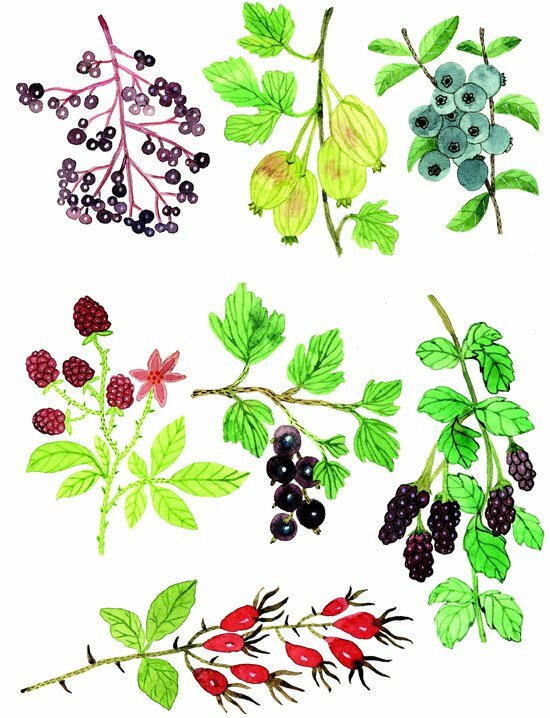 Elderberries, gooseberries, blueberries, raspberries, black currants, boysenberries and rose hips are great, colorful fruits to grow in your garden. A great many trees, shrubs, vines, hedgerows, vegetables, and herbs can serve the garden landscape as backbone plants, establishing a multistory environment that creates microclimates and habitats. They set the stage by welcoming birds, beneficial insects, earthworms, garter snakes, and toads to make their homes and raise their young in and near the food garden. Read Plant a Perennial ‘Backbone’ for Your Vegetable Garden by Tammi Hartung in Mother Earth News.